No matter where you live, July means you may be dealing with brutal summer heat. Unless you keep your rabbits in an air-conditioned space, heat can literally place your rabbits’ lives at risk. 85 degrees Fahrenheit (29.44 degrees Celsius) is just about the maximum temperature at which your rabbit remains relatively unstressed. At temperatures over 90 degrees (32.22 degrees), rabbits can die. And the effects are cumulative. Don’t let your rabbits’ survival fool you. They may survive day one, but by the third straight day of heat, you may indeed start losing rabbits. What to do: You can bring the nestboxes in the house during the worst of the daytime heat, returning them to the doe in the cool of the evening. The doe will be just fine with this, most likely. But how do you keep rabbits cool? We’ve posted quite a few great ideas at Cooling Rabbits - check it out! Feel free to contact us if you have additional questions about cooling rabbits. Summer heat can also stress young pet bunnies. You could see some bunny diarrhea, and if you do, it could get bad, fast. Lots of pet bunnies are kept outside. If yours is outdoors, you might want to keep a close eye on the daily temperature forecasts. The prime age for bunny diarrhea is between 5 - 10 weeks old. At this age, their bodies are still finding a healthy balance of gut bacteria that will keep them healthy and make their vitamins for them. If you add many days of heat into the mix, the bunny could die of the heat, or end up with an enterotoxemia from a gut imbalance, which can also kill in a hurry. 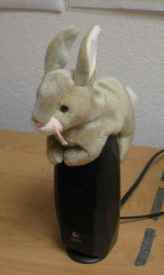 1) Keep your bunny as cool as possible (see Cooling Rabbits). 2) Always keep some timothy or orchard grass hay available to your pet bunny. This keeps the intestines moving and will prevent the build-up of unwanted bacteria. 3) Learn more about bunny diarrhea here (page-down toward the bottom to the section titled "Mild" Bunny Diarrhea). All about Rabbits: Books books books! From kid books about rabbits, to adult how-to-raise-rabbits books, even scientific educational books all about rabbits. Rabbit Supply: Check out this page for links to rabbit supply companies and sources for most everything you may need for your pet rabbits or hobby rabbitry. 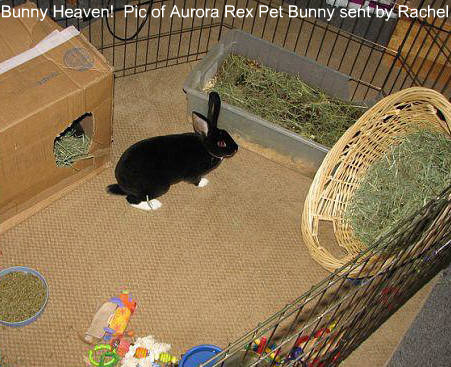 'Hermes’ is an Aurora Rex pet bunny adopted by Rachel. Heheh - he’s beyond pampered...! Have a great, not-too-hot, July!